As part of the voter awareness campaign for ensuing Lok Sabha election, the Election Commission of India (ECI) and Indian Railways have come together to utilise four long-distance trains to urge voters to cast their votes on the polls days. The ECI has collaborated with the Indian railways for a vinyl wrap of trains with messages from icons urging people to participate in the general elections. "We are appealing voters to cast their votes on April 11," Vijayawada District Collector MA A Intiyaz told ANI while flagging off train no 12626 from New Delhi to Trivandrum Kerala Express at Vijayawada railway station on Saturday. The trains which have been selected on the longest North-South route and East-West route and covers 19 States in all are - Kerala Express, Himsagar Express, Howrah Express and Guwahati Express. 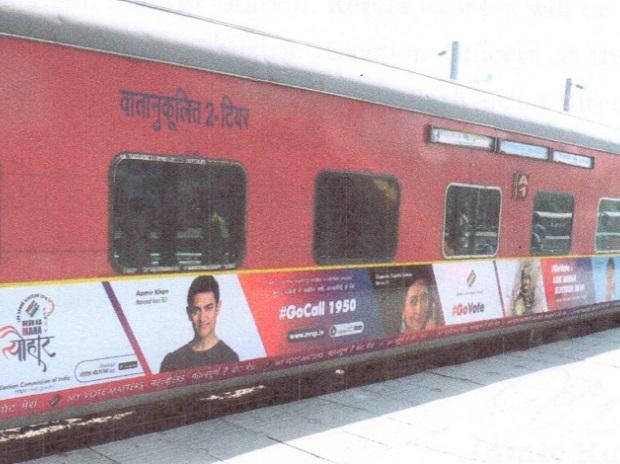 The trains display important contact numbers including the voter helpline number and the National Voters' Services Portal besides a series of motivational messages urging voters to cast their votes. The seven-phase polls are set to begin on April 11 and will go on till May 19. Counting of votes will take place on May 23.